Dartmouth Town Council posts anti EU post on its facebook page! 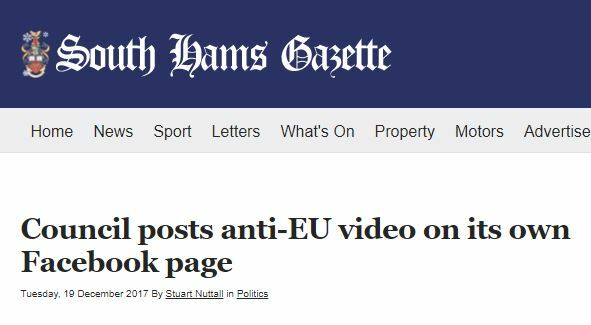 In a strange departure from the rules Dartmouth Town Council posted an anti EU video on their official Facebook page. This is against their own official rules for social media which state “…official social media sites will not be used for political gain or campaigning”. A South Hams council is being questioned after a post appeared on its official website of a Leave.EU video. This is despite its own social media guidelines stating: “…official social media sites will not be used for political gain or campaigning”. At the moment, it is unclear who posted the video on Dartmouth Town Council’s Facebook page on Monday evening. But the council’s guidelines state: “… social media sites are controlled and managed by the elected chairmen/vice chairmen of specific committees, the mayor/deputy mayor and clerk to the council, to be named as the communications team”. The town council and the mayor have been invited to respond to a series of questions posed by the Dartmouth Chronicle. The town council said on Tuesday morning, in response to questions from Chronicle: “You are correct in assuming that this is in contravention of our social media policy. Stop Press: It appears the Councillor responsible for the posting was Cllr. Springett. I agree with his sentiments but not with his posting on the DTC site. Leave.EU, a vehement anti-European Union campaign group, was co-founded by Arron Banks, one of the largest donors to UKIP until he was suspended from the party earlier this year. The Brexit-backing millionaire businessman is being investigated by the elections watchdog over his donations in the EU referendum last year. The Electoral Commission has announced that it will look into whether Banks committed offences over donations or loans made to campaigners during last year’s referendum vote. The video post on the council’s Facebook page has now been removed. Paul, it is obviously open season to attack the town council, but if your idea of journalism is simply to reproduce a story from the Dartmouth Chronicle, you might at least reproduce the up-to-date version (which appears on the Chronicle’s website) that shows the response. That confirms that speedy action has been taken. If you check David I was one of the first people to comment on the post on Facebook, before the Gazette even saw it. I also updated my site as soon as I saw the response from the Council. Perhaps you need to focus on your own Councils problems rather than criticising those who maintain an oversight. Perhaps we can be told who posted the comments. Cllr Gent, we are always happy to report what the council does collectively or what councillors say individually. I am not sure what you mean by “open season” but, l guess, you might have in mind some of the recent “own goals”. If councillors keep shooting themselves in the proverbial foot, you can’t blame us for reporting it. 1. “Happy to report”. I would dispute the word “happy”; perhaps “willing” might come close. Only a fraction of what goes on at council meetings finds room in your paper. This is an observation, not a criticism. 2. “If councillors keep shooting themselves in the proverbial foot…” Well, I have just examined my feet and they are conspicuous for the lack of bullet wounds. Some very few councillors may do this, but you know very well that most do not. Councillors are volunteers who are brave or foolhardy enough to stand for election. Most attend meetings at inconvenient hours, and work damned for the town outside those meetings. I am sure I am not alone in keeping a “case work” file where I take up problems for members of the public. These go unreported because they are confidential, but I spend a lot of time on this. AS for those “own goals”, I imagine that you may be referring to a recent incident where a councillor was foolish enough to express an opinion that did not sit with public opinion. For that she was insulted, threatened, and abused on social media by people who had never met her. Paul Reach, in response to another post of mine, suggests that councillors are there to serve the people. To an extent he is right, but in my view the public can disagree with us (although I hear from as many people agreeing with me as disagreeing on most things) but should do so politely. Perhaps I am old-fashioned. Surely, Stuart, as a journalist you agree with free speech. So “own goals”, “shooting in the foot”: these things are never subjective. Seasons greetings to you and all our readers. We are happy to report councillors’ opinions. If they then go around denying they what said and denigrating us on social media for reporting their views, that’s their concern but it is tiresome. Cllr Gina Coles, a former editor of the Chronicle, reported us to our regulator, IPSO. After a three-month long investigation the newspaper was cleared of any wrongdoing… Has she apologised? Not that I am aware of. We try to be accurate… we don’t obfuscate and we don’t condone Facebook vilification. Others can voice their opinions, the newspaper doesn’t. You say councillors are volunteers, I agree. Some perhaps might do well to consider whether the “badge of honour” that goes with it bears some responsibility to those who voted for them – and even those that didn’t. Honesty and openness is the hallmark of a democracy. I am not entirely convinced all councillors seem to have grasped that. In particular, there has been outrage from some over filming of council meetings – and this occurred before we had filmed one! Why? Are councillors shy, ignorant of the law or just being plain awkward? With the greatest respect to my friend and fellow councillor David Gent and his comment of “Open season to attack the town council” the public have every right to do so as we are accountable for our actions, including this anti EU posting, Cllr Gent has been formidable with his input to Council Standing Orders over many years and knowing him he will leave no stones unturned to find out who sanctioned this posting and as we are open and honest will name and shame and penalties imposed. Our council sadly is on a public roller coaster ride and its self inflicted we can only get back on a level track when we start listening to public opinion and resist from the temptation of believing that we have all the answers, Communication, sharing information and community inclusion is on my wish list for 2018 and does not include propaganda. Wise words from a Councillor with a committment to serve. When an organisation lacks transparency it can only lead to this sort of error. We, the rate payers, are paying all the bills here so we must be told what our money is being spent on. We also have the right to challenge our public servants if we do not agree with their actions or decisions. This is democracy. Paul, I am glad you maintain “oversight”, but Quis custodiet ipsos custodies? Wondering if the local Business Community has missed the news that the last remaining Bank in Dartmouth is shortly about to close down for ever! Having spent 35 years in various self-employed business’s myself, I view these closures as dynamite and am very surprised that none of our local Councillors seem at all surprised, and have so far ignored making any form of protest on this draconian decision by the National Westminster Bank authorities. It will certainly affect local small shops and decrease footfall in Dartmouth and District in the near future! Sadly Tony the local business community is no longer represented by any organisation. The Chamber of Trade and Businesses has faded from view due to poor support, so this private blog of mine was set up to provide information and support to the businesses of Dartmouth based on my 5 years as Chairman of the Chamber. If you read my other articles you will see that I have been expressing my concerns about the catastrophic collapse in footfall numbers in Dartmouth for some time now in the hope that someone with authority will recognise the need to respond in some way. The Closure of Banks is not the cause of low footfall its vice versa, the low footfall has made it easy for the banks to justify branch closure. I admit I do occasionally use this blog to express personal views, because it is my blog, but it is quite a lonely path I tread fighting for the business community of Dartmouth. Until we learn to fight together then I fear nothing will change. Especially by the Town Council who seem to have a blind spot where the business community is concerned. Quote, Tony Crawford..closure of Nat West Bank, local councillors not surprised…for me, I was and angry that we are powerless to stop it, as its a corporate business decision based on the theory that falling numbers in footfall to local branches as a big percentage of its business is online and the same goes for retail shop closures and the infrastructure of towns all online shopping is killing it off….perhaps it’s time for government intervention from the Communities Secretary when he realises that he has no communities left to be secretary of?